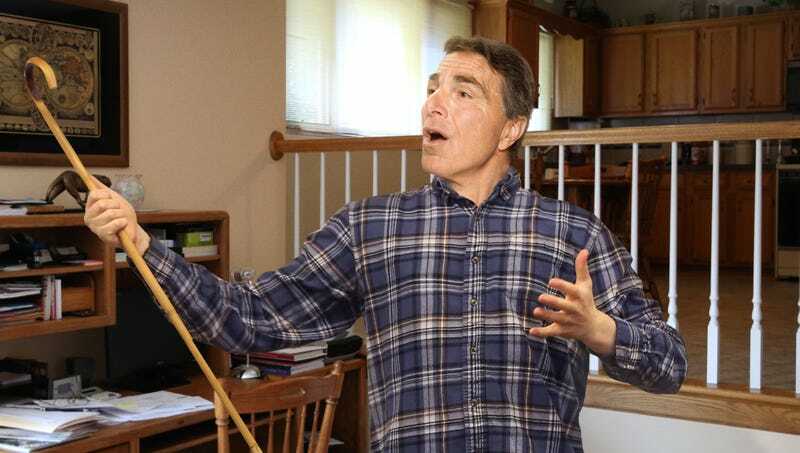 PORTSMOUTH, NH—Saying that an inability to properly cope with his feelings often led them to come out in sudden and unexpected ways, the family of local man Drew Walton told reporters Friday that they wished he could find a healthier way to express his emotions than always bursting into a full-blown musical number. “Dad kind of bottles everything up until he finally reaches a breaking point and erupts into a perfectly choreographed song-and-dance routine,” said Tricia Walton, 16, confirming that even seemingly small inconveniences such as misplacing his phone or hitting traffic could cause her father to explode into an up-tempo ditty about the highs and lows of modern life. “A couple days ago, he found out that Mom threw away some of his old magazines and he went nuts. He was belting out notes in multiple octaves, doing bell kicks all over the place, sliding down the banister—it was a full-on showstopper. And sure, he’s singing about how one man’s trash is another man’s treasure, but I know that he’s really upset because he doesn’t feel appreciated. Anyway, he must have been going on like that for 15 minutes, looking for someone to start a duet with, before he finally soft-shoed into the garage. I just wish he could go to therapy or something instead of having to put everyone through this.” Walton speculated that her dad’s outbursts might be connected to being raised by a father who would reportedly stay in bed for days at a time doing nothing except reprising the same mournful ballad.